Responsible serving is about creating memorable experiences for consumers, spotting signs of excessive drinking and acting professionally and responsibly at all times. Why do you need to know about responsible serving? It is important to be aware about both the negative and positive effects of alcohol, and about how our bodies process alcohol, so that you have a better understanding of your customers drinking choices and when to advise them not to drink. Reduced liability exposure for your bar. Enhanced business where you are in control of the liquids you work with and are using them in the most appropriate way. The type of alcohol in the alcoholic drinks we consume is a chemical called ethanol which has the chemical formula: CH3CH2OH. To make alcohol, you need to put grains, fruits or vegetables through a process called fermentation (when yeast or bacteria react with the sugars in food - the by-products are ethanol and carbon dioxide). 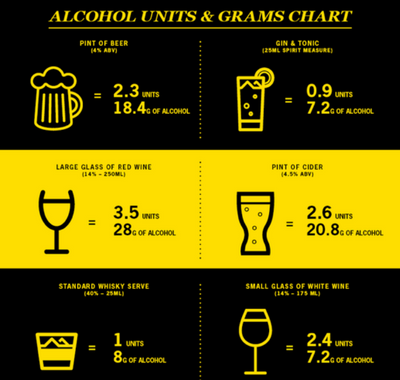 Alcohol is alcohol, regardless of the type of drink (such as beer, wine, or spirits). When comparing drinks it is important to look at the amount of pure alcohol that is in a drink by looking at the units in the serve. Remember - no type of alcohol is ‘safer’ than another. What matters is how much and how we consume alcohol. The effects of drinking alcohol vary from person to person because of who we are, how much we drink and the different ways in which our bodies process alcohol. When you drink, alcohol passes from the stomach to the small intestine, where it starts to get absorbed into the blood stream. Once in the bloodstream, alcohol travels through the system affecting every cell that contains water – which is the majority of them. The liver will start to release an enzyme called alcohol dehydrogenase (ADH), which breaks down alcohol at the rate of approximately one unit an hour. This process cannot be sped up! It takes about five minutes for the effects of a drink to be felt. Alcohol stimulates the brain cells and adrenal glands which can give you an initial feeling of relaxation - making you feel friendlier and more open. However, alcohol is actually a depressant, as it slows down the nervous system. Slowed reaction times, impaired judgment which can lead to risky behaviour, and when alcohol is consumed rapidly in excess it can result in acute alcohol poisoning. Alcohol dependence or alcoholism and various physical diseases such as pancreatic problems, and liver cirrhosis. In extreme cases, heavy drinking can result in brain damage and death. Minimum Legal Age to purchase or consumer alcohol (LDA). Remember - the minimum drinking age may be different to the minimum legal age of purchase. Always ask for proof if you are unsure. Maximum Blood Alcohol Concentrates (BAC) for drivers and operators of other dangerous machinery. Guidelines for sensible alcohol consumption. Restrictions covering the marketing, packaging and sale of alcohol. Diageo advise NO DRINKING if you’re going to be driving – it’s the only way to be sure of being safe. As a professional, as well as being aware of the legal guidelines, it is also important that you are able to spot the signs of intoxication and assess when someone has had enough. Most commonly, the signs of intoxication include: slurred speech, impaired co-ordination, slowed reactions and diminished judgement. 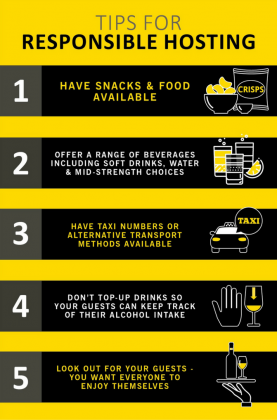 There are various tips for responsible hosting – from offering snacks and non-alcoholic drinks, to ensuring you measure your spirits correctly so that you not only don’t waste liquid but that both you and your customer know how much alcohol is in their drink. There may be times when you have to deal with customers who have consumed too much alcohol. If you can strike up a rapport you should suggest they alternate their alcohol consumption with soft drinks, eat some food and drink some water. Most importantly you should not serve them any more alcohol. Inform your manager or another member of staff that you’re about to refuse to serve a customer- that way you have support. Explain politely that you’re unable to serve the person any more alcohol. If necessary, ask your manager to explain the situation to them. Always be polite and sincere. For more facts, information and recommendations around responsible drinking visit www.drinkiq.com.